Art takes a whack at cooking brill for the first time. 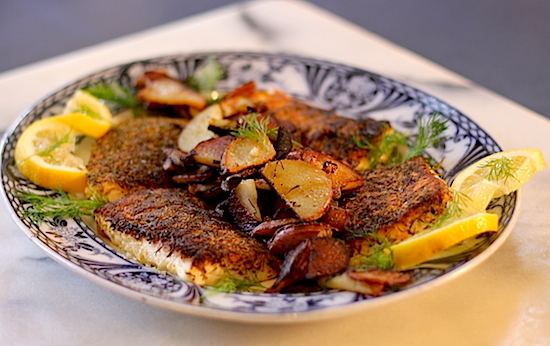 Coated in spices and blackened along with some thyme butter, this simple fish dish fits right in with Art’s Cree Country onion and dill spuds. It’s all so good, and so easy to make, that Art recommends taking it to the bingo. • In a small bowl mix together your herbs and spices. The thyme, oregano, smoked paprika, cayenne pepper, black pepper and corn flour. • Chop your potatoes in half then into fairly thin slices. • In a preheated pan, coat the bottom with Canola oil. Add in your sliced potato. Use the Canola oil to get things going, then add in the butter a little later. • While the potatoes are cooking, slice it into about 1 inch (2.54 cm)thick fillets. • In a shallow, yet large enough dish to fist your fillets, place your flour, herbs and spices in the bottom. Coat your fillets in the flour, spices and herbs, but just on one side only. Coat the non spice and herb side with some olive oil. • It should be about time to add in your onions and fresh dill to your potatoes. Also add in a little water, cover the pan with a lid and turn the heat down to a low-medium heat. • In a medium heated pan, place your fillets herb and spice side down. Add in sprigs of thyme and a bit of butter. If you like you can bast the butter over the brill. • Cook for no more than 2 minutes. • Place the brill on a baking sheet, non herb and spice side up. Bast the rest of the butter over the birll and place in the oven for 5 minutes. Place the brill on a plate, add the potatoes, onions and dill. Then garnish with pieces of a dill sprig and lemon wedges.